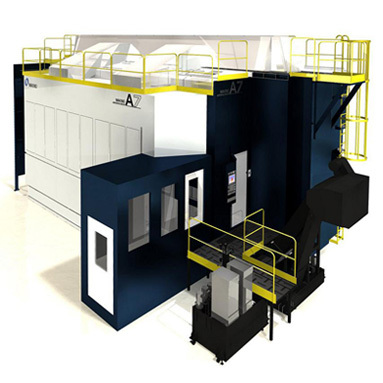 Makino’s A7 is the latest in a new line of 5-axis aluminum machining centers for the aerospace industry. Based on the MAG design, the A7 provides accuracy and reduced cycle times for large, complex aluminum monolithic structural parts. The A7 is designed with extended X-, Y- and Z-axis travels of 276 inches, 99 inches and 40 inches (7,000 mm, 2,500 mm and 1,000 mm), respectively, to accommodate part sizes up to 276 inches by 79 inches by 28 inches (7,000 mm by 2,000 mm by 700 mm) and 11,024 lbs. (5,000 kg). The machine’s extended Z-axis travel provides increased side-face machining efficiency for improved productivity and capability. New linear motors in the X-axis produce thrust forces of 30,000N for acceleration rates up to 0.5G, further increasing productivity through reduced cycle times. Featured in the A7 is Makino’s new patent-pending Volumetric Accuracy Compensation technology for improved tool-tip positioning accuracy. This technology provides in-process tool-tip corrections for sustained dynamic accuracy even in complex three-dimensional geometries in parts up to seven meters. The A7 is equipped with a 33,000-rpm HSK-F80 spindle with high-power output of 107 HP (80 kW). At peak power output, the A7 spindle produces chip-removal rates up to 5,400 cc/min. With the A7, operators are offered the option of an automatic pallet-changer system for continuous operations that eliminate costly part change-over downtime. A standard 60-tool capacity automatic tool changer (optional 120-tool capacities are available) is equipped for unattended machining capabilities. An added bonus is that the A7 can be integrated with an automatic pallet transfer and storage system in a highly flexible Makino Machining Complex (MMC2). This automation system assigns work and initiates operations automatically, maximizing spindle utilization for increased productivity.